We will Birdie On! 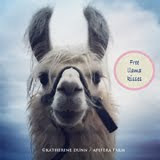 More Love Llamas are coming! And we are raising money for the final barn addition! 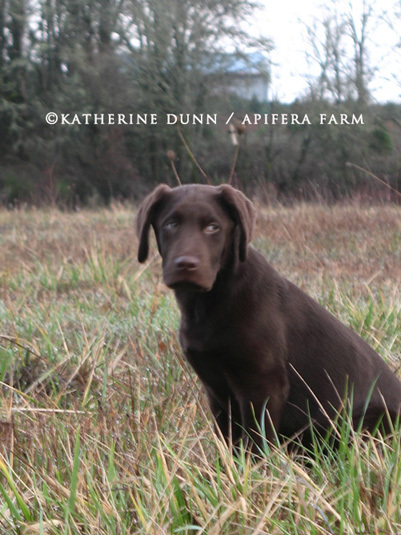 Apifera Farm is a registered 501 [c]. 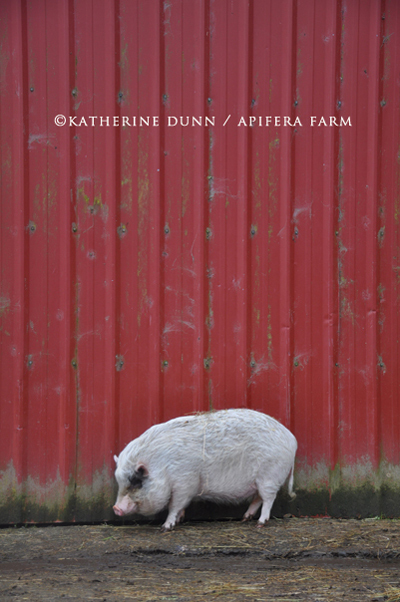 All images ar©Katherine Dunn. I like to go internal on the day before the New Year. Or at least, I don't partake in parties or resolution lists. I do however love the week after Christmas and before New Year's - I clean the studio, sort, shred, and this year rearranged my drawing areas as there was always something not quite right. It feels much better now and I'm excited to get painting for my May show. So I thought about all the things I could write about for New Year's and I just keep hearing the same message: I'd rather be here right now than anywhere else. The day I quit feeling that, I will evolve in the direction my soul leads me. I can't imagine leaving Apifera, but I have no control over future experiences that might change my perspective. And Apifera is a breathing entity, she doesn't control me or smother me in any way. I know many are in pain, are poor, lack things they think they need or want but there is still joy and hope to be found in each day. I know it is hard to feel this way if you've lost a loved one, are struggling at work, are care taking elderly parents or lack resources to move. And if you are physically challenged and in pain, or mentally challenged without proper help, my words might seem simplistic and naive. I have many days of despair about one thing or another - the blog gives you the calm version, the well thought out version without anger or frustration. But this one internal message is something I carry everywhere - there is still joy in each day, like a little pig standing against a red barn. The 32 page book, "Bucket & Donkey", opens with only sixty words of text, and lush full page illustrations. An old bucket in the milk barn is tossed aside due to a hole in his side. Thrown in the burn pile he assumes his life is over, but moon encourages him to dream of a new life, and he does. 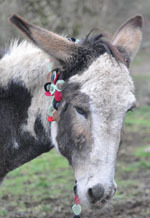 With the help of the Wind, and a little donkey, Bucket goes on to a life of purpose and sharing. Rather than have this book project sitting in a pile on my desk, waiting for the right publisher, I decided to make it available on Blurb. I'll continue to pitch it to editors, but my life is too short to wait for a publisher - don't you agree? I'd like to go out of this world knowing I shared as much as I cold through art and story. Waiting for a publisher seems to be counter productive to that. The frustration of working on a project and not seeing it go out into the world is sad for me. I'd rather just let people enjoy it. 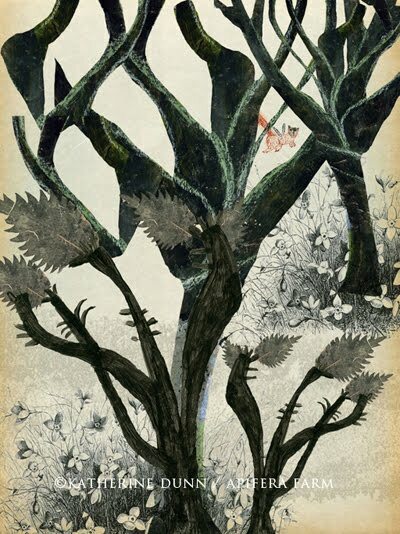 And so far, I've heard from people that really loved the quietness of the story and found the art lush and beautiful. I plan to do more little books like this and hope you are able to enjoy some as they become available. We lost Doris over the holiday. She was an old duck, the mother of the other ducks collectively known as The Bottomtums. I buried her in the pumpkin patch after laying her out for the others to view. She'll feed the worms and grubs now and her fowl clan will graze above her. They did not mourn and accepted her death as part of the lapse of a day. Good role models for me, I'd say. 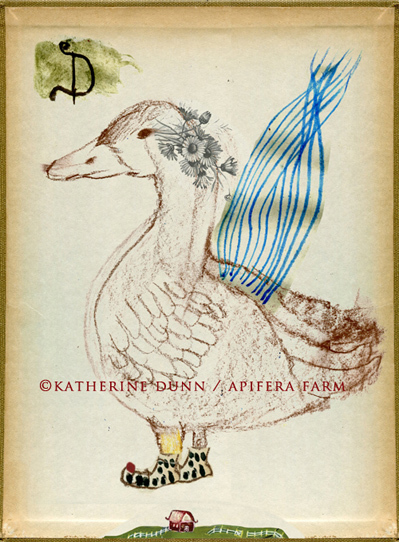 I gave Doris beautiful blue wings and new shoes to go about her next journey. Farewell,Doris! You were a very good duck! May your day have moments of a nature's theater - and may you recognize its peace. I see wings as my connection to universal wisdom. When my wings are on I can feel them and I think I am at my best because they make me lighter as a spirit, softer in my views and choice of words. This image is available as original art - but also as a beautiful new art card with three separate art panels - the words make it a beautiful way to share New Year Wishes or encouragement year round. The annual songs and ponderings of the season from the Puppet with a big heart and his side kicks, Olive Oil the little lamb and Stella the goat with the voracious holiday appetite. Besides learning the real deal about Santie Claus, this season, after some songs, Pino explains his heartbreak...and sends a lovely message to all those suffering from broken hearts. She makes me happy. I needed that this morning - the look on her face after she finished a special treat of left over squash pie, orange mash covering her little snout and lips. Comfort comes to us in small ways. You look to your routine to get you back on track. 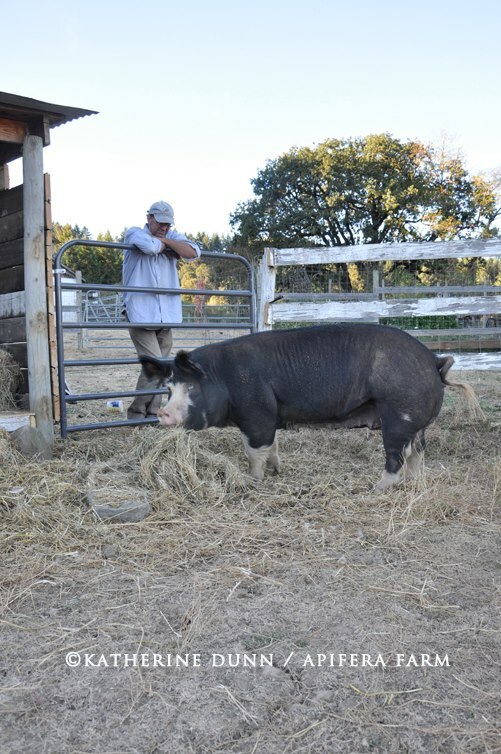 I'm thankful part of my routine is feeding a little pig who so enjoys her breakfast - everyday. The sadness of the day fills the farm. 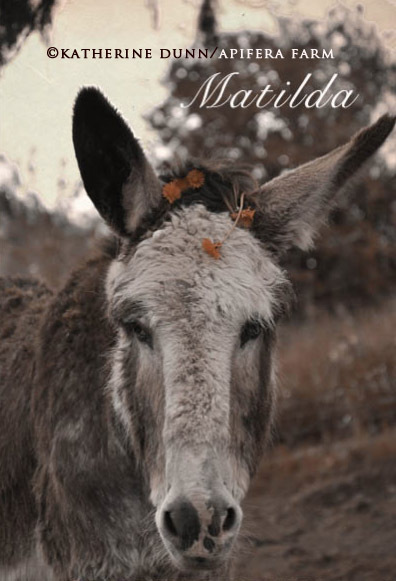 Even little donkeys can't bring cheer today. We hold the parents and survivors in our hearts and wish for wings for all the little souls now floating on - and peace in time for those left behind. 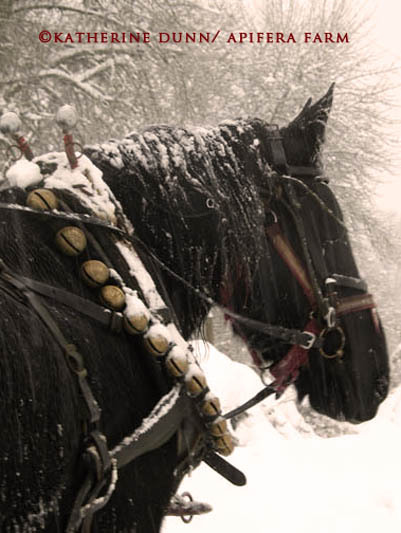 My latest entry on the Huffington Post, "Love Letter to Father Christmas", is now online. I thoroughly enjoyed writing Father Christmas again after all these years and a got a bit teary eyed doing so. The post is a gentle reminder that one should never give up believing in their dreams. The yin and yang of nature is clearly depicted in the daily scene of the winter pumpkin patch. Old friends lie deep down beneath the dirt, their bones and skin providing a perfect meal for slugs and worms. Along come the The Bottomtums who dig with beaks, gathering up the once squirming mud dwellers. I like to see the living mingling with the dead. It helps to see life as a circle, not a line. And in times when I miss a creature or person that has physically left, I can remember that the body feeds the dirt that feeds life - a body simply moves on to another form, vaporizing into air before it lands on something before it's lapped up by chicken, fish or mouse. We will all be eaten one way or another. 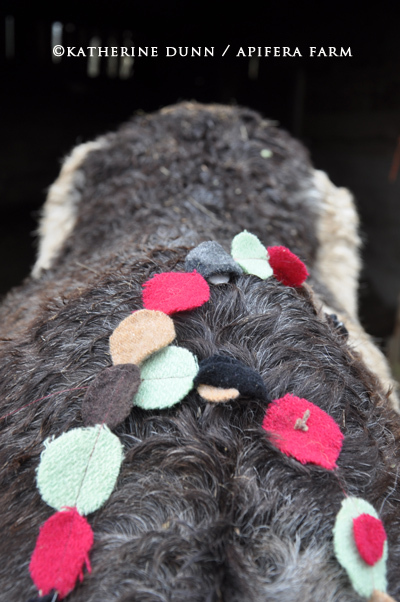 Last year, a follower of Apifera sent some lovely vintage fabrics and a gift of a felted garland she made. One thing led to another and before I knew it I was sharing the garland with the barnyard and then sharing the photos with followers. The happiness it seemed to bring to so many in such a simple way left an impression on me. So I declared it a new holiday tradition - The Christmas Garland Festival. 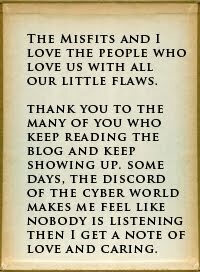 I hope you enjoy the slide show - thirty plus images of the Misfits and then some. 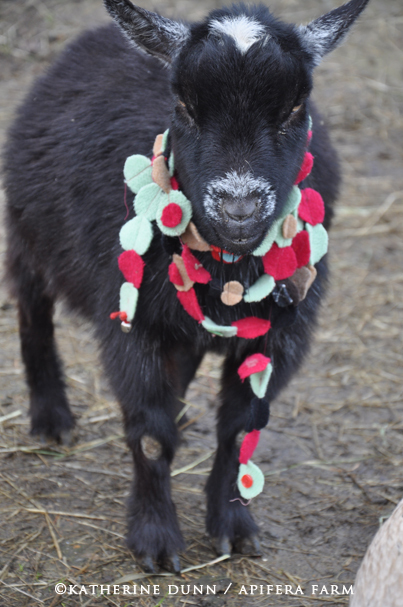 Wilbur the Acrobatic Goat chose to observe versus participate - one must not force garland wearing. Raggedy Man would have nothing to do with it, and he was much too busy flirting with The Head Troll - flirting is a kind word. In the end, I garlandized The Dirt Farmer. The man doesn't take a bad picture, does he? 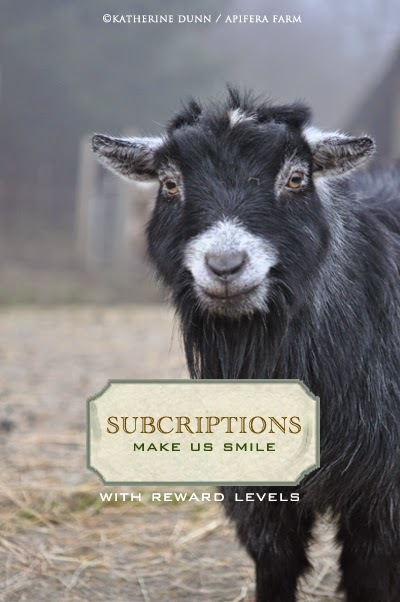 My latest entry for Huffington Post, The Walking Goat Soul, tells the journey of Stevie, the handicapped goat - from a mud field of neglect, to a kind hearted veterinarian and staff, to our friends at Sanctuary One where he met Rosie the pig, and finally to the barnyard of Misfit at Apifera. You can help support Stevie and all the other Misfits at their fundraising page. You can also buy art cards of some of the Misfits at the Etsy shop. 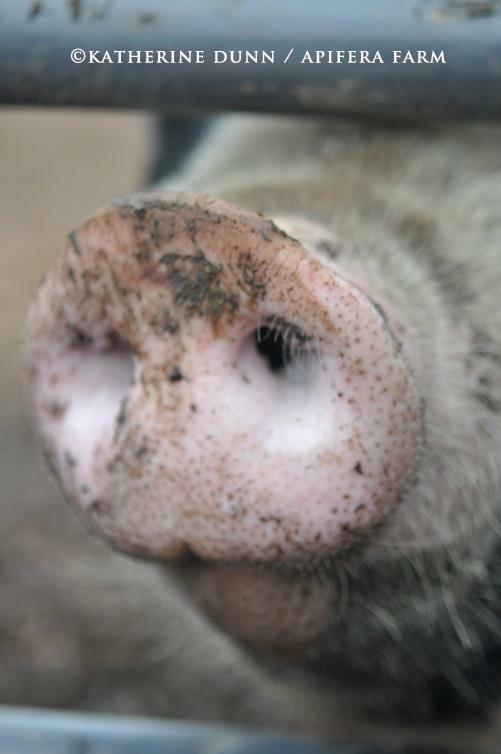 I am still editing and working on the Misfits of Love, the book I hope to have published someday about the creatures that call the barnyard their final home. You try to guide them, but at a certain point one has to let them just make their own mistakes. I reminded them last year that if they took the time to carefully roll the lights up into a tidy ball, then this year it wouldn't be so hard to untangle the string. 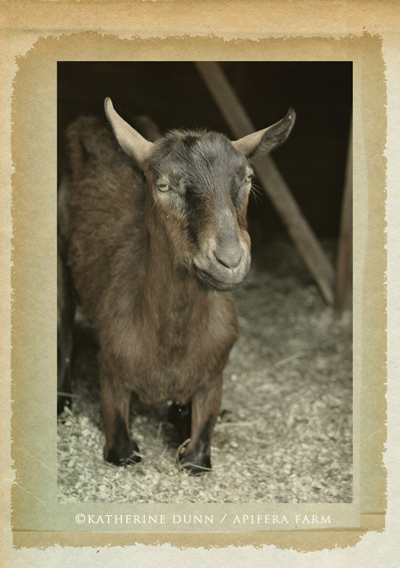 The last I looked out to the barnyard, I saw several small statured goats running around in the dark, all lit up. It was very festive. You'll have to endure a trip down memory lane every now and then. Muddy turned three recently. I just can't believe it's been that long. As Huck will be turning 8 in January I occasionally suffer from 'Awwww" moments when I come across an older photo of one of them. "What? Who me? I didn't do it." Lots of Animal Prints at Shop! 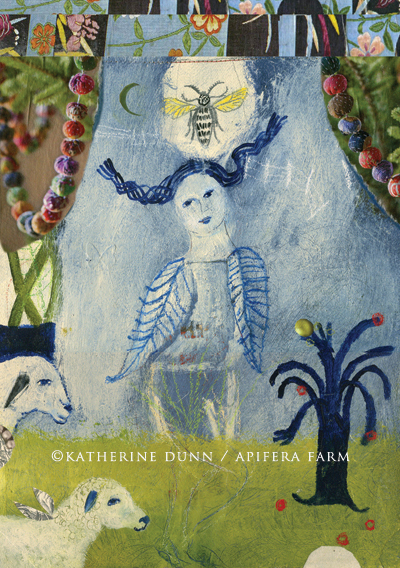 2019 Writing a monthly article for Lincoln County News Maine with stories from Apifera called "Tails and Tales from Apifera Farm"
2018, October Apifera given the "Be The Change" Award from Spirituality and Health Magaine . 2018, September Art showcasedon Spirituality and Health Magaine . 2018, August Interview of Katherineand how she got to where she is today in Voyage Atlanta magazine . 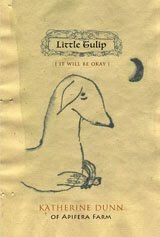 2018, July Little Tulip a new illustrated book is published . 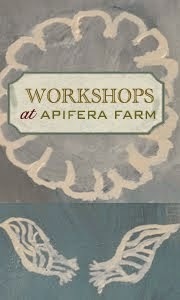 Uppercase Magazine Issue 30 article features an article about me and Apifera and rural living and art making. My article about working as a shepherdess but also helping the the endangered species living in our fields in the 2nd issue of the new Wild Hope Magazine. Interview with Katherine at Miss Marple's blog. My new article in Mabel Magazine Issue 4. is out. 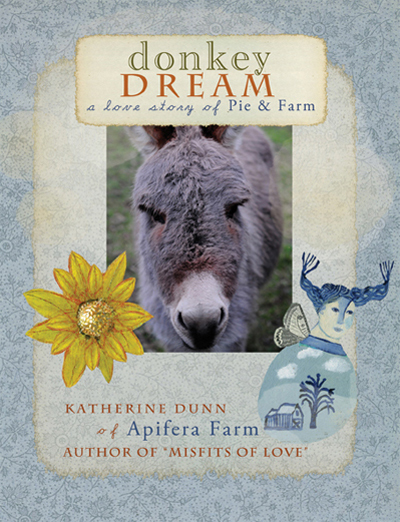 The healing aspects of donkeys at Apifera, for Modern Farmer for Modern Farmer. 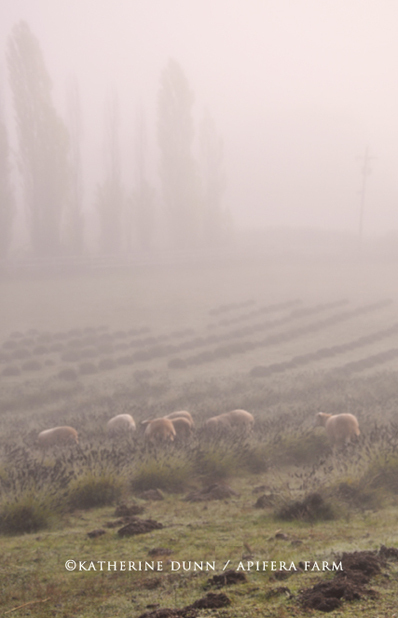 Article about raising sheep at Apifera for Modern Farmer. 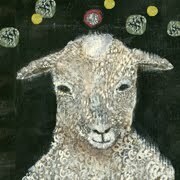 Ellie Garber of Ellie + Friends will be selling my book in indie shops out East. Thrilled! Buy a copy of "Misfits of Love"Apifera Press! 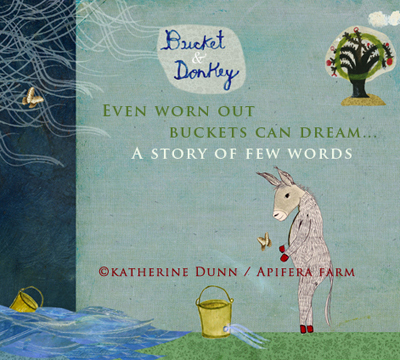 "Bucket & Donkey" now available as ebook! 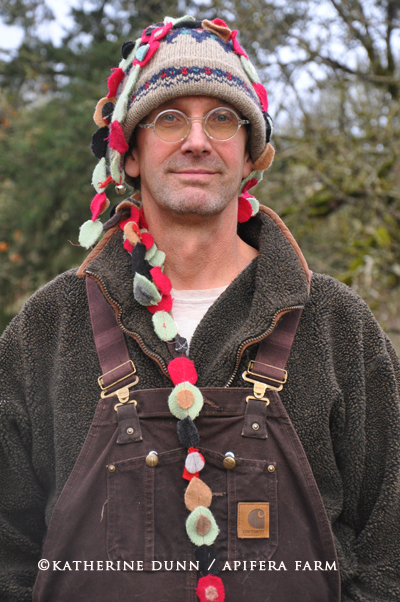 Interviewed in Summer 2013 issue of Willamette Valley Life. Solo show in May at The Adamson Gallery in Sacramento, CA. Featured article in The Jacksonville Review about my Rosie and Stevie. 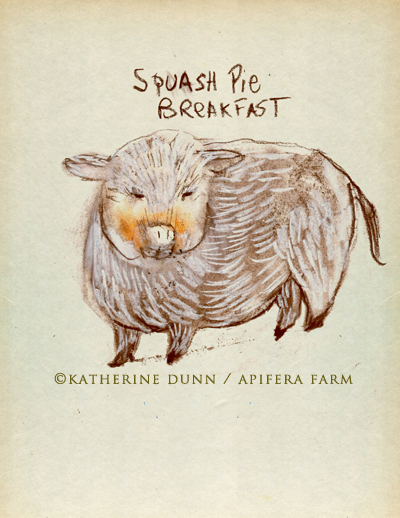 Feature article on Apifera and my art and life helping animals and sharing pie. July issue of Willamette Valley Life Magazine, July, 2012 issue [see spread 10/11]. Four new illustrations for University of Notre Dame Magazine summer issue. Had fun chatting with Mark Lipinski about "Misfits of Love". Podcast for 1/25/12 episode here. I'm the first interview. I'm going to do some writing for "Life with Dogs". Interview at Blu Penny about life and career. 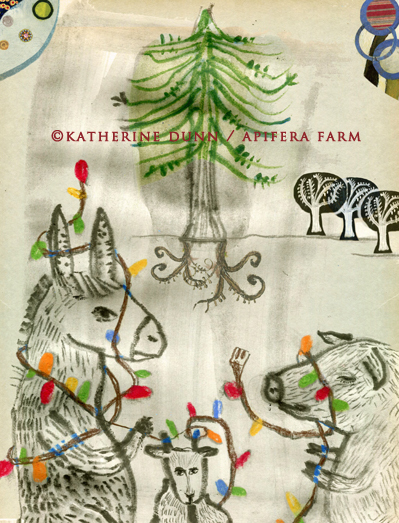 Podcast with Rice Freeman-Zachary about Pino, the farm, art and more. Interviewed by Mark Lipinski on Creative Mojo. I was interviewed by Lesley Riley of Blog Talk Radio/Art+ Soul. Airs May 9, 7PM EST. I'll be writing regular posts on the Huffington Post. Here's the first one. Wow, I'm thrilled, the new book is part of the Top 10 Editor Picks for Arts 2010 at Amazon! 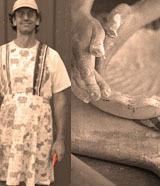 Somerset Life/April,'08: To Wear an Apron > article written by Katherine on life as an artist/farmer/apron wearer. 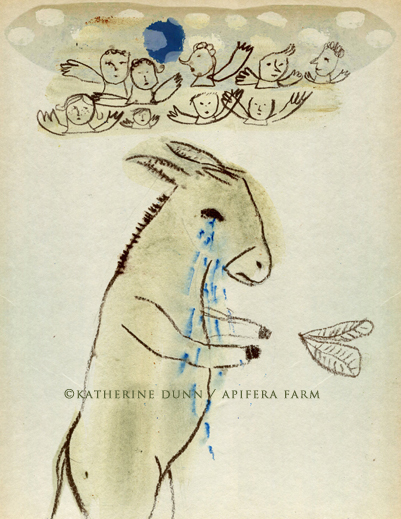 Somerset Life/July,'08: Donkey Dreams > article written by Katherine on pie,donkeys and her Donkey Dream. You must gain permission to re-use any images, words or photos from this site. You can use the 'share' feature to show an entire link, but you can't take my images/words and use them without permission or negotiation. All images/test/photos ©Katherine Dunn. No usage without consent.. Simple theme. Powered by Blogger.